Martin Gustafson | Backing vocals on "Marching to the Heartbeats"
David Sundqvist | Intro loop on "Dim" and programmed drums on "Dark City, Dead Man"
For most bands, the first few albums usually show their influences on their sleeves before stepping out into their own sound. Cult of Luna's 2006 masterpiece “Somewhere Along the Highway” is their first record that significantly departed from the Neurosis/Isis post-metal template and fully embraced their differences between them and their contemporaries. A concept album loosely based on the novel Life & Times of Michael K by J.M. Croetzee, “Somewhere Along the Highway” deals with themes of male loneliness and disassociation from society. It begins with the minimalist atmosphere of “Marching to the Heartbeats” which displays sparse vocals and a surprising lack of percussion. An unusual slow tension build throughout the song flows directly into the next track “Finland” which starts with a military drumbeat under splashy chords; laying out a powerful melody which builds into the screaming vocals which dominated their earlier releases. The tension continues to build into an expected “huge riff” section and this is where Cult of Luna first departs from the expectations of the genre and lets you know this album is going to be different. Transitioning into another minimalist section where chords ring out over an almost jazzy backbeat, the strong melodies which are a hallmark of this album begin pouring in. Slowly building using songwriting reminiscent of classical music, by reintroducing instrumentation into a shift into the next section, while continuing to build tension so when the distortion kicks in, the payoff hits that much harder. After the close of “Finland,” the third track “Back to Chapel Town” begins with an airy section reminiscent of the first track. However, unlike the previous tracks, Cult of Luna avoids a common album pitfall in this song by beginning to build a little quicker once the drums kick in, making sure the listener does not get used to a particular songwriting trick. In addition the previous songs switched between loud/quiet relatively frequently and once this track goes loud it stays loud until the end. The fourth track “And With Her Came The Birds” is a departure from Cult of Luna's sound and from earlier albums in particular with a minimalist almost folksy vibe as the song progresses. The raw production of this album really shines through on the acoustic section in the middle of the track significantly enhancing the mood with raw acoustic instrumentation and confessional level vocals. Despite being one of the shorter tracks, and not involving the huge dynamic shifts of the rest of the album, this intimate interlude breaks everything up nicely and sets up the vastness of the closing three songs nicely. I was lucky enough to see Cult of Luna on their last US tour and they played the album closer ‘Dark City Dead Man’ and it was absolutely huge live. Interestingly there is a Czech pianist who does a cover of this entire album, which I linked below, that is also pretty amazing and helps shine a light on just how good the melodies really are. In closing, this is what I would call a “deep” album in that it's a little hard to get into but the more you listen to it the more you stay with it. This is the kind of record that you might not be into until you hit a down moment in your life and need something to take you on a journey. I encourage anyone that hasn't heard it to wait for that moment, light up if that's your thing, lie down, and go somewhere. 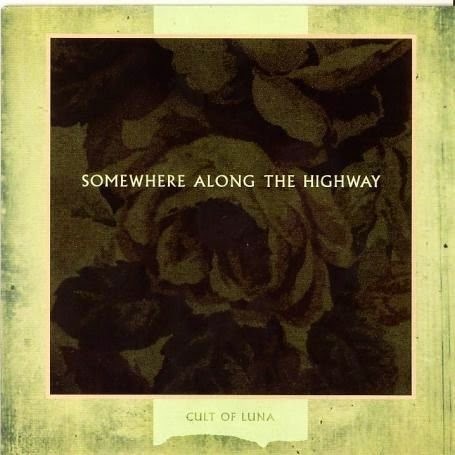 “Somewhere Along the Highway” is Cult of Luna's fourth full length released via Earache Records on April 24th 2006. The album was rated 5th on Decibel magazine's top albums of 2006. Music by Cult of Luna. Produced and arranged by Cult of Luna. Recorded Winter 2005 at the Octagon Barn and Tonteknik Recording, Umeå, Sweden.